“Here is the place. 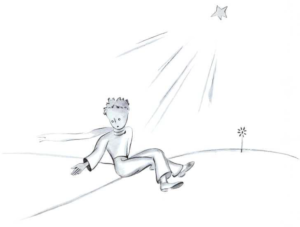 Let me continue alone,” said the little prince and he sat down because he was afraid. He waited a little. Then he stood up. He took one step. I couldn’t move. I saw something yellow which moved quickly near his leg. He didn’t move for a moment. He didn’t cry. Then he fell down gently as a tree falls. There wasn’t even any sound, because of the sand. This all happened six years ago. This is the first time when I tell this story. When I returned, the people were happy when they saw me alive. I was sad because I lost the little prince but I said to them that I was only tired. Now I’m not so sad. I know that he returned to his planet, because I didn’t find his body at sunrise. But here’s something interesting. 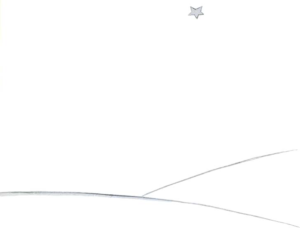 The fence which I drew for the little prince wasn’t very big. Sometimes I say to myself, “Everybody can forget sometimes. Everybody can forget to put the glass over the flower on some evening. And the sheep can come to the flower in the night and…” Then the bells change to tears. Look up at the sky. Ask yourself, “Did the sheep eat the flower or not?” And you will see how everything changes. For me, this is the most beautiful and saddest land in the world. I want to make another picture of it. It’s the same as the picture before, but I drew the land once more. I want to remember it better. 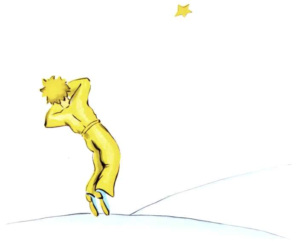 It’s here where the little prince appeared on Earth, and disappeared. Look at this picure carefully because you can come to this place one day if you travel in Africa, in the desert. And, if you really come to this place, I am asking you, please don’t hurry. Wait a little when you’re under the star. Then if a little man appears who laughs, who has golden hair and who doesn’t answer your questions, you will know who he is. If this happens, please, be so kind, don’t let me be sad, write to me quickly that he is back.